Ocean View Home at Poipu Beach, A/C. Aikane Kauai vacation home is among the small handful of homes at Poipu Beach and is ideal for couples, families and small groups. Our home has comfortable, high quality beds and is fully equipped with snorkel gear, boogie boards, beach chairs, free WiFi via high speed cable and lots more. It is also one of the few homes with air conditioned bedrooms (wall mounted a/c). Aikane is Hawaiian for 'friendly' which best describes this delightful beach house. Planning on staying less than a week? Please click the "Ask Owner a Question" link or call to inquire. Poipu is known as one of the best beaches for its beauty, sand bottom lagoon, sunsets, warm people, safety, climate, activities, golf and restaurants. From shallow lagoons to superb snorkeling and body surfing and boogie boarding at adjacent bays. Travel Light. No need to rent, buy or pack gear. We equipped the house with about everything you might want for the beach including masks, snorkels, boogie boards, beach chairs, beach umbrellas, beach towels, coolers and more. We keep quite a few items at the house. These include a coffee maker with a permanent type filter and a coffee grinder, full separate sets of bath and beach towels, laundry soap (usually enough for your stay) and also a collection of beach toys and gear. Families are welcome. We understand the creativity and inquisitiveness of children so we provide beach toys, games, dvd's and more so parents can have a relaxing time. Best of all our home is so close to several great beaches, lagoons and huge grassy play areas, you can just put on swim suits and walk to the end of the road and along the coast and you are there. No need to pile into a hot car and drive. How sunny is Poipu? Very! Hot water and electricity for our home are provided by the abundant sun with seamless backup when needed. Chris and Theresa are the owners and managers of Aikane Kauai vacation rental. Chris was raised on Kauai. Both have spent many years exploring, biking, hiking and kayaking around the island. Their philosophy is to provide travelers clean, well equipped accommodations for a good value that people will want to return to and also recommend to their friends. Integrity and friendly professionalism with the aloha spirit are the foundation. Chris and Theresa are members of the Poipu Beach Resort Association and have deep roots on Kauai. You can book with confidence. Aikane Kauai vacation home is located on the sunny side of the island and centrally located giving you quick access to several beaches in the neighborhood, beautiful coastal walks along the nearby wild Mahaluepu coastline with secluded beaches just east of the house, and shopping and dining nearby. Our home is on a quiet side street. The nearby beaches offer great swimming and snorkeling even in the winter when Hawaii's famously large surf rolls in to the north and west coasts. The north shore is an hour to the east and north and the spectacular vistas of Waimea Canyon and Kokee State Park are an hour in the opposite direction. Master bathroom has an oversized double headed shower. The second bathroom has a tub/shower. The ground floor bathroom has a zero barrier shower. There is also a hot shower outside to rinse off from the beach. Among the small group of homes at Poipu Beach. Enjoy the ocean view from the lanai, living room and dining area. Wall mounted a/c units in all 3 bedrooms. Ceiling fans, good cross ventilation, thermal windows, fully insulated. This is a cool place to stay. High speed broadband via a cable modem and secure router. Separate sets of beach and bath towels provided. Cable modem and secure router. Password is on the router. Sofa and chairs for 6. 2 top golf courses within a mile. Air conditioned bedrooms (wall mounted A/C), full kitchen, boogie boards and beach chairs, masks and snorkels, covered parking, free wireless internet access (WiFi) and lots more. We thoroughly enjoyed our stay at the house due to the fabulous location to good walks, ocean views, and access to great snorkeling. The house has many creature comforts and a deck that serves as a gathering place for morning coffee whale watching or breezy evening star gazing. Wonderful vacation home on Kauai! We really enjoyed our stay in Poipu. We were 3 generations (4 adults and a teen) traveling together and the house worked perfectly for us with 3 spacious bedrooms with very comfortable beds. The 3 full bathrooms were also a nice perk. The house was very clean and well organized and had a beautiful view of the ocean from the front deck. The kitchen was also well stocked with all the essentials. The house was a short walk from a nice beach (best for snorkeling) where we were lucky to see Hawaiian Monk Seals and sea turtles. The sunsets viewed from the end of the street were spectacular! We also enjoyed walking to Brennecke's beachfront restaurant for Happy Hour and desserts. Chris, the owner, was most gracious and accommodating in terms of working with us on arrival/departure times. Overall, I would highly recommend this property and would not hesitate to stay here again. Great location, attentive managment, we’ll stocked, great for hanging out in between beach time. The place was perfect for our group. The downstairs is set up as nice living space which was perfect for my older in-laws. The lanai was great for hanging out and BBQing. Off street parking for 2 vehicles was nice; very close to the ocean 1/2 block walk; attentive managment and very clean. Perfect for a relaxed vacation away from the resorts. Mahalo for the review! We hope you will all return soon. We were fortunate to find this house last year, as we were making our travel plans, and so glad we did. There were 7 adults in our group (family and friends) and the house more than met our needs. The location was perfect, with just a short walk to an amazing beach. There were plenty of toys and supplies for days of fun in the sun! The house itself is spacious, comfortable, and well stocked. Chris (the owner) was always easy to reach and able to assist with questions we had. In the event we are lucky enough to get back to Kauai, we will definitely come back to this house!! Mahalo for your kind and helpful review! We'd love to have you all back. We truly enjoyed our stay at the house. It was comfortable and livable. Every morning our group of six - two couples in their 60's/70's and two sons in their late 20's met on the lanai for breakfast and a discussion of the day's activities. We also enjoyed the lanai for our evening meals. The set up two bedrooms up and one bedroom down was really appealing giving the 20 somethings a separate hang out including tv and a small refrigerator for their beer. There's great beer on the island if you were in doubt. The house is a couple of minute walk to the beach, very close to restaurants, shopping, downtown Koloa, farmers markets and sights in Hannipepe and beyond. The North Shore is a bit farther, but close enough for a day trip. We never made it up to the North Shore due to all the great stuff to do around Popiu/Koloa etc. The house is well appointed - kitchen is well stocked with pots/pans/dishes/etc, all of the beds were comfortable, it was clean - everything you are looking for in a beach rental. The additional plus was having a carport for two cars never needed to worry about parking. Don't hesitate about renting this house - you will not be disappointed. Thank you Chris and Theresa for a great house. Don't be surprised if you see us on the calendar next year! Mahalo for your exceptional and very helpful review! I also wanted thank you all for taking such good care of everything. We'd love to have you all back. Nice home close to Poipu Beach. Nice location. Had all we needed. Close to Poipu Beach. Was warm in mid day, but we were not home then most days. Aikane Kauai Vacation Ocean View Home has 3 bedrooms, 3 baths and A/C bedrooms. 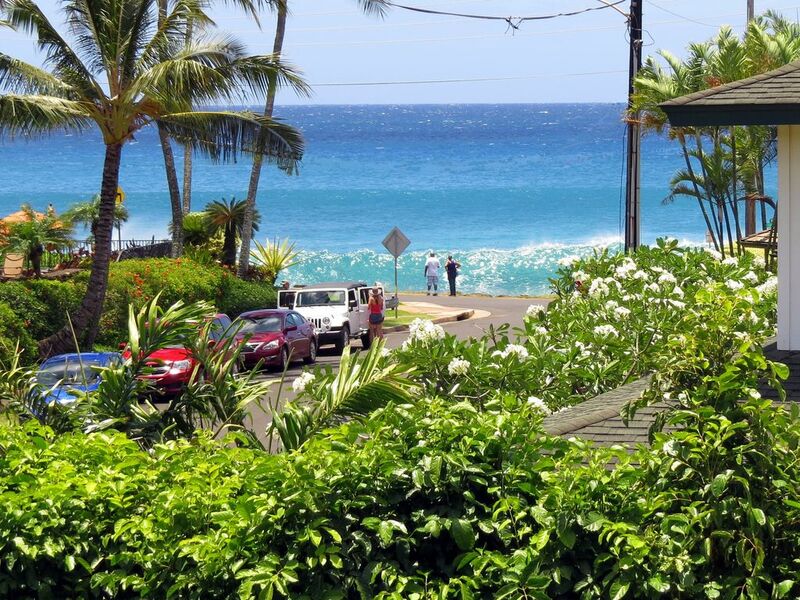 It is among the closest homes to Poipu Beach. Enjoy the convenience of staying by a variety of great snorkeling, body boarding and swimming beaches. No need to pile into a car and drive, you're already there! Please note that "Courtesy Holds" are not shown on the calendar and the 3 night minimum is allowed on a fill-in basis. Please call or write to confirm availability or if you would like a no-obligation hold on dates. Monthly rate is for 4 weeks. 7 people max. The youngest to the oldest and everyone in between are counted as people. Cancellations: Must be in writing by e-mail. Deposits and payments are fully refundable less a $100 cancellation fee if cancellation is made at least 90 days prior to arrival. Cancellation notification within 90 days may result in forfeiture of the rent. There will be no forfeiture if I am able to re-rent to another party for the period affected by the cancellation. Trip insurance is recommended. Last minute specials offered for open dates within 60 days. TVR #3363. Aikane Kauai is fully permitted by state and county agencies.